4. What were you doing before CrossFit? 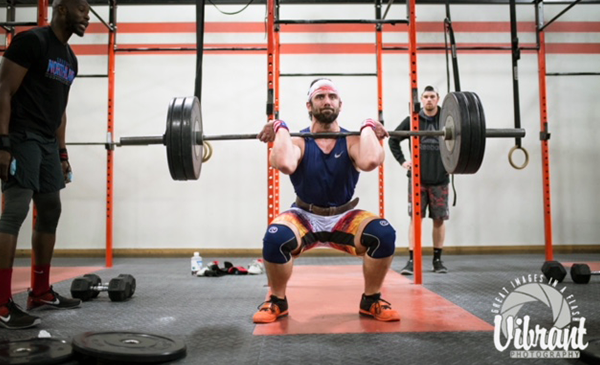 How did you hear about CrossFit and/CrossFit Northlake? Before CrossFit, I was a standard gym rat and doing 12oz curls every other day. Katie, my wife, had done Crossfit before for a few months and got us involved at CFN. Does air guitar, flexing in front of the mirror, and sucking my gut in count as a sport? I love the Open. The energy during Friday Night Lights is indescribable. I love seeing people PR and do things they didn’t think they could. Be patient and don’t compare yourself to others. In the beginning, I was getting better, but it was more due to me just getting better at the movements. I’ve noticed a big change over the past year and a half since I started paying more attention to my diet and competing more in the WOD’s. I never thought I would have abs after college, haha. I’m the Warehouse Manager for Carolina Fitness Equipment and owner of Caveman Cuisine. Both my wife and I like being active, and doing it at a place like CFN with amazing coaches that push you and an awesome community that supports you makes it that much easier.